Almost from the earliest days of the church, John's distinctive presentation of Jesus has provoked discussion about its place among the other Gospels. One cannot help but see the differences from the Synoptics and wonder about the origins and character of John. In this new volume in the New Testament Library series, Marianne Meye Thompson explores the ministry and significance of Jesus of Nazareth as presented in the Gospel of John, paying special attention to the social, cultural, and historical contexts that produced it. John's Gospel, Thompson posits, is the product of a social-cultural world whose language, commitments, and contours must be investigated in order to read John's narrative well. In doing so, Thompson studies the narrative, structure, central themes, and theological and rhetorical arguments found in the Fourth Gospel. Thompson's expert commentary unpacks and illuminates John's unique witness to Jesus—who he was, what he did, and what that means. "Thompson has written a richly rewarding theological commentary that reads the Fourth Gospel first and foremost as a story of Jesus. No one is better qualified today to write such a commentary, and Thompson's work does not disappoint. Both pastor and scholar will be greatly rewarded by giving this work their attention." "In this exceptional commentary, Thompson wears her deep scholarship lightly. 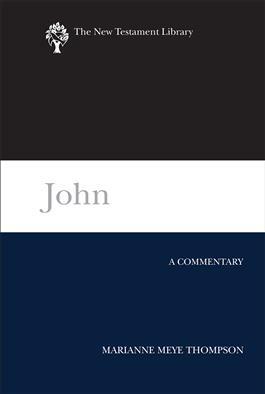 We are given a clear and fresh vision of John's portrayal of Jesus and its enduring significance for today. Here is real insight." "Both the specialist and the less informed student will find here a careful and faithful reading that traces the actual contours of the narrative while not ignoring historical considerations, literary context, patristic traditions, and contemporary scholarly debate. Professor Thompson's main concern is to 'illumine the witness' of the evangelist and so to train the lens thoroughly on that witness's 'understanding of Jesus—who he was, what he did, and what that means.' This she does, with grace and erudition." "Without neglecting the cultural contexts of this most 'spiritual' Gospel, Thompson demonstrates the depth of the Gospel's scriptural roots and, in conversation with interpreters ancient and modern, the breadth and height of its theological claims. This expert engagement with the Gospel narrative is a much-needed contribution to its contemporary interpretation. It will now be my go-to commentary on John."